Transparent, Flowing, Polyester Adhesive. Made with polyester resin in two parts, adhesive and catalyst. 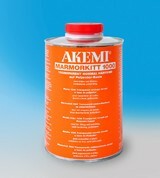 Ideal for bonding and filling marble, granite, travertine and natural stones. In the latest formula the use of solvent has been reduced. A special resin has been introduced to increase the adhesive power, making application and polishing easier. Available both in liquid and solid form for vertical use. Don't forget to purchase hardener! 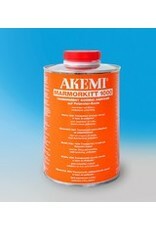 AKEMI Marble Fillers 1000 Transparent is a highly liquid 2-component product based on unsaturated polyester resins dissolved in styrene. Marble Fillers 1000 Transparent are mainly used in the stone processing industry for bonding natural stones, reinfocement of natural stone slabs with glass fibre products (laminating) and forming of rock substitutes with crushed rocks and sand. resistant to water, petrol, and mineral oils. The surface to be treated must be clean, completely dry and slightly roughened. Colouring is possible by adding AKEMI Polyester Colouring Pastes up to max 5%. Add 1 to 4 g of white hardener paste to 100 g of filler (4 to 5cm of paste pressed out of the screw tube corresponf to 1 g). Mix both components thoroughly. The mixture can be worked for about 3 to 16 minutes (20°C), depending on the product. After 20 to 60 minutes (depending on the product) the treated parts can be further processed. The hardening process is accelerated by heat and delayed by cold.